Is Print Dead or is it that the Strong Survive? Spoiler alert: We at Tippingpoint Labs absolutely do not believe that print is dead. We believe it is a powerful medium. Having said that, many believe that print is dead, as witnessed by the 46 million results from a Google search and by these sad stats. Perhaps we are simply witnessing a Darwinian evolution of the print species. The question is, what strategy makes a publication survive and can it be adopted by the weaker? Circulation numbers for newspapers and magazines are down. Advertising to editorial page ratios are out of whack. Local papers, around for 60+ years, are closing up shop. Rising printing costs prohibit quality production. It’s bleak. Just this past February, TechCrunch posted a compelling argument about the demise of print periodicals and provided some great ways for publishers to right the ship. Digitally. But a quick move to digital may just exacerbate the problems experienced in print. On a Sunday morning, I do not think to myself, I’m going to lie on the couch and surf the web. No, I want to “lose myself” in a good book or a great article. Print evokes a feeling that is not often found on the web. Think about even how advertisers track success online: page views, time on page, bounce rate. It’s not assumed that once consumers get to a online destination that they are engaged there. Viewers are tracked against these stats to understand engagement patterns. And the patterns are not impressive. Think about how advertisers measure success in print publications: circulation, pass-along, page count, advertiser pedigree. The assumption is that if a reader purchases the magazine, they are engaged with it. They will consume the content. Perhaps not cover to cover, but chances are they are not bouncing after 1:37 minutes. The assumption is that the reader (along with the advertiser) is buying the quality of the magazine sight-unseen, based on past experience. So, as a publisher, if your numbers are down, your readership has dropped, and your advertising revenue is plummeting, do not blame paper or print. The fact is that over time, the audience has determined that the quality no longer meets their standards. The engagement has been lost. If the articles were online, there would be high bounce and exit rates. Being online does not fix the problem. Even within this losing industry, there are some winners. Bridal, personal finance, and entertainment are showing gains in ad pages which may indicate the strength of these niche topical publications. New magazines are emerging like Du Jour poised to compete with Jason Binn’s previous invention, Niche Media, and publications like Departures from American Express. The fact that these three target the ultra-wealthy 1% (or in Du Jour’s case the .003%) may be a indicator of success though and not all print publications can tailor their content for this desirable audience. Publications can, however, learn from their previous content to become more tailored and better in tune with the audience they have garnered. As a marketer, I get frustrated when a sales rep calls and tells me the audience their media reaches is women aged 35-54, with a household income of $75k+. You have a duty to understand the audience better than that. What articles did you write that received the most notes to the editor? If your articles are online, which are most read or emailed? This is where you find your niche and understand your audience. Follow the ants, don’t try to build a new colony. Publications with very focused content and a deep understanding of the audience are going to survive. Look at McSweeny’s Lucky Peach quarterly journal. At $12 for a single issue, it is not a small investment — in print no less. No content found online. But every Chef and die-hard culinary enthusiast reads it. Devours it actually. Readers lose themselves in the articles. And then, we keep it as a resource. 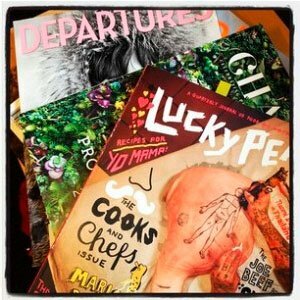 Oh, and guess what – Lucky Peach barely has any ads. As a publication, would you rather have increased readership or serve a very small highly engaged audience? Which makes you more of a resource, which makes you more of a commodity?